In 2017, 91% of U.S. transportation energy came from petroleum, nearly half of which came from foreign sources. Widespread adoption of electric vehicles (EVs) can substantially reduce U.S. oil imports, increase the energy efficiency of transportation, and reduce greenhouse gas (GHG) emissions. To realize these benefits, EVs must compete with conventional vehicles in terms of price and driving range, both of which are influenced by the cost and storage capacity of the EV’s battery. ARPA-E’s RANGE program aims to maximize a battery’s energy storage potential and minimize its cost at the vehicle system level. This will require robust energy storage chemistries and new battery cell and pack architectures. RANGE technologies seek to reduce the weight of vehicle energy storage systems while curtailing the need for added impact protection and enabling systems to perform additional functions. To increase the appeal of EVs, automakers are seeking to extend EV range, while reducing the total volume battery systems occupy in the vehicle. One approach is to reduce the cumbersome, high-strength packaging that protects cells from temperature swings and crushing during an accident and develop alternative means of ensuring safety. Innovations that make batteries more tolerant to physical abuse, so that they may be used as multifunctional structural materials in the car would eliminate the need for such packaging. The past decade of investigations in thermal runaway mitigation for Lithium-ion (Li-ion) batteries has yielded several promising but disparate techniques. Evaluating and integrating these distinct techniques presents an opportunity to optimize system performance for multifunctional batteries. The University of California, San Diego (UCSD) team sought solutions to the RANGE challenges at both the vehicle system level and the cell level. At the vehicle level, the team employed computer models to determine how a battery pack could replace other parts of the car. 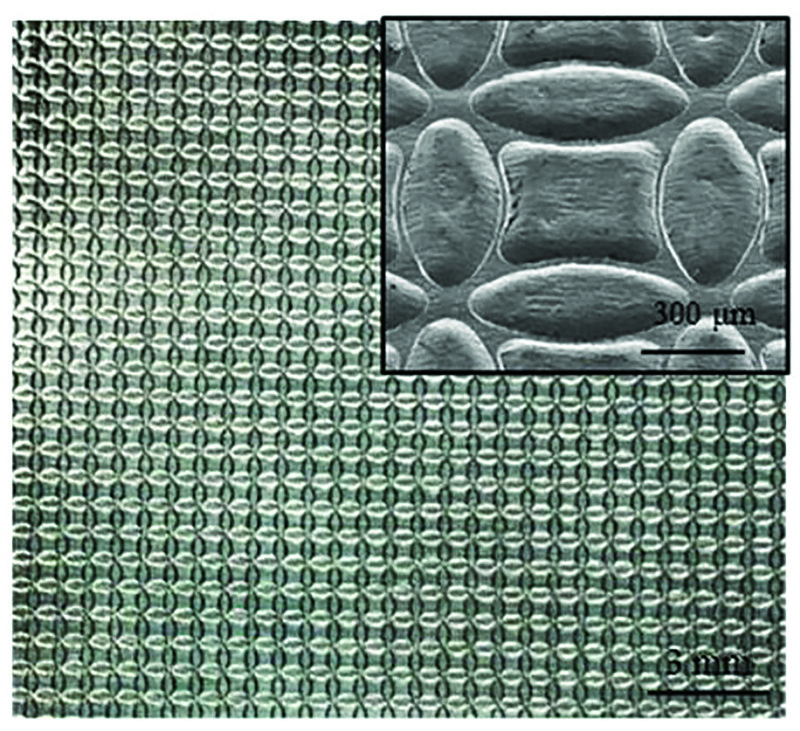 At the cell level, the team developed multiple techniques to build battery cells that are more tolerant to abuse. Computer simulations were used to optimize structures and locations of battery packs for both occupant survivability in a frontal crash and net cost and weight savings. The simulation complied with Standard U.S. Federal Motor Vehicle Safety Standard (FMVSS) tests; specifically the Occupant Compartment Acceleration zone had to be kept below 30G during a simulated crash. The team successfully designed a pack that passed this simulation with a peak acceleration of 29.5G while reducing the car’s net weight by 136 lbs. Additionally, the team constructed a partial mock-up of the design that passed impact tests, further substantiating the viability of the design. Figure 1: Image of the UCSD patterned current collector used to prevent cell thermal runaway. At the cell level, multiple approaches were taken to improve cell robustness by reducing or eliminating Li-ion battery thermal runaway against thermal, mechanical, and overcharge abuse. The three most successful technologies were: 1) a proprietary safety coating that separates damaged portions of the cathode from the current collector when the cell is penetrated; 2) a patterned or “debossed” current collector that disconnects damaged battery parts when crushed (Figure 1); and 3) fire retardant additive pouches surrounding the cell that assure battery safety in a crash without significant weight/volume burdens on the cell. 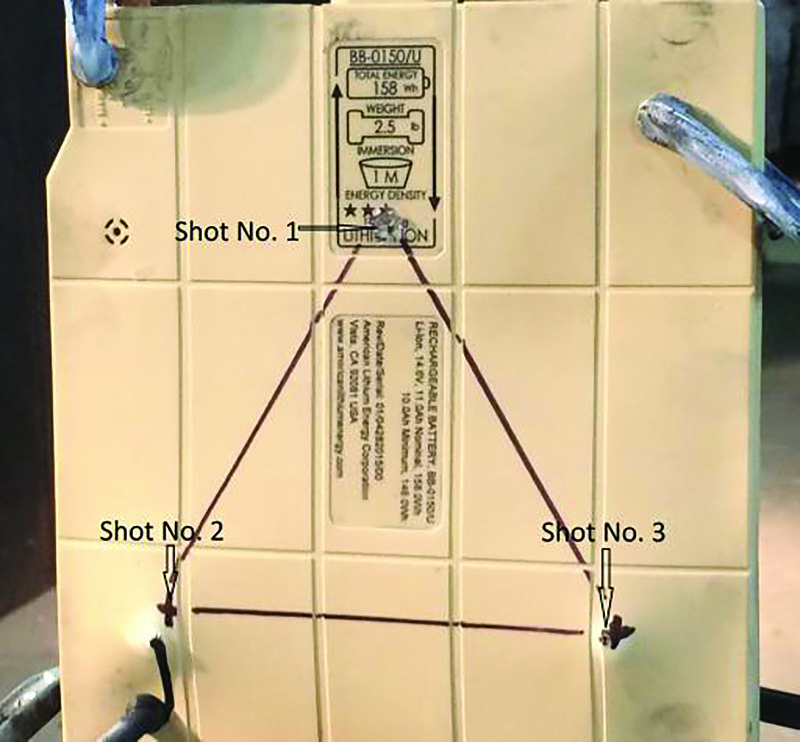 Cells made with UCSD’s safety coating and debossed current collectors successfully passed standard abuse tests that included nail penetration, overcharging at 2.5 factor capacity, heating to 160oC, and shooting through by a high-caliber rifle (Figure 2). Li-ion cells employing conventional cathode materials with the UCSD modifications passed all of these tests without the usual catastrophic cell deflagration. Cells treated with the UCSD safety technologies showed no appreciable change in overall performance during normal operation and maintained their volumetric energy density. At project completion, the UCSD team produced a 1 kWh battery pack using their safety coating technology, with an energy density of 163 Wh/kg at an additional cost of only $0.30/kWh. This additional cost constitutes less than 0.2% of the current cost of storage in EV packs. UCSD’s technology is currently being tested by the U.S. Department of Defense (DOD). The team developed a prototype for a standard DOD Model T6 battery pack, made with cells of conventional Li-ion chemistry but employing the UCSD team’s safety layer technology. Currently, T6 cells provide power for ancillary electronics on 95% of all U.S. military vehicles. If testing is successful, the DOD will provide funding to manufacture a 1 kWh battery pack with the technology. UCSD’s partner, American Lithium Energy (ALE), recently announced a new joint venture company with Bren-Tronics to manufacture these cells. As this technology improves, it could enable the sale of commercial battery packs with higher energy density that otherwise could not be used today due to safety concerns. Figure 2: UCSD cells packed into a military battery pack. The three points on the triangle indicate high-caliber rifle shots. The UCSD battery cell and pack safety technology is expected to reduce the cost of EV battery packs by making the individual cells safer, thereby reducing the overall weight necessary to encase and protect the cells from damage during a crash. UCSD modeling efforts show that specially designed battery packs can be used to help absorb the impact of a crash, while decreasing vehicle weight. The combination of these two features would increase range and decrease costs to promote large-scale EV adoption. As of January 2018, the UCSD team’s project has generated three invention disclosures to ARPA-E, and three U.S. Patent and Trademark Office (PTO) patent applications have been filed on the disclosed inventions. The UCSD team has also published the scientific underpinnings of this technology 15 times in open literature. U.S. Energy Information Administration, Monthly Energy Review, Tables 2.5 and 3.8c, April 2017.